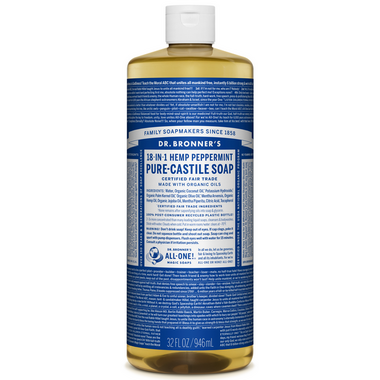 Dr. Bronner's Peppermint Organic Pure Castile Liquid Soap is Dr. Bronner's most popular fragrance. The peppermint essential oil tingles the body and clears the mind. Therapeutically, peppermint oil is a mild stimulant which increases vitality and clarity. All oils and essential oils are certified organic to the National Organic Standards Program. Packaged in 100% post-consumer recycled plastic bottles. I use this soap for making my own hand soap, it works great! Love this! Like all Dr Bronner soaps its a fantastic all purpose cleaner. This scent is delicious too- a tie for my favourite with the Dr Bronner citrus one. Great peppermint scent that tingles as you wash. It doesn't get any better than Dr. Bronner's soap! My favorite soap, my favorite scent. Wonderful product. I wish I could order in even larger sizes. I use the unscented for hand soap, body wash and shampoo, but I mix the peppermint liquid soap with water and thyme oil to make a spray bathroom cleaner. It works great and the thyme oil disinfects. We include the spray cleaner in welcome packages for new residents on our lake. This product is amazing can be you fro body wash, hands, shampoo, cleaning fresh tingly peppermint. Iâ€™m using this for literally everything. Iâ€™ve made a shampoo out of it, replaced foaming hand soaps with it, made a cleaner, used as bath soap and shaving gel. You definitely donâ€™t need a lot and can mix with quite a bit of water. Simply love it. Gently to skin, powerful on dishes. I find it very impressive that I can use this stuff both as a shower gel on my sensitive skin and for any household cleaning. The beeeeest! I love for all cleaning and hand soap - another advantage is the pepperment smell keeps spiders, ants and mice away - they hate the smell. Love this product. I use it to wash my floors and as a hand soap. I also use it to add to all the skim care products I make for myself! Itâ€™s great if you love the smell of peppermint! Great product - use it in all of my hand soap dispensers - scent is fantastic. Great smell and love the cool refreshing feeling. So happy I gave this soap a try. Smells great and gives a cool refreshing feeling. Cleans well. I use this product for everything around the house and it truly works wonders! I use this as a hand soap and in a solution as a gentle bug repellent for my plants and it works perfectly. Our family uses Dr Bronner's castille soaps for our hand soap. Our family's fav is the peppermint. It is great, and works well in the foam soap dispensers as well. Love this soap. So far I only use it to make foaming hand soap. It works great and love the scent. After first trying this peppermint liquid soap years ago, nothing else compares. It rejuvenates and refreshes so deeply, I always feel so much better after a shower with it. Whenever we have guests sleepover, they keep talking about how amazing it is and want to get a bottle themselves too! The best soap around. Really impressed with it! This is an excellent product for with so many uses. I use it for bathing and also as a household cleaner that is harmless to animals. It doesn't leave soap scum on shower doors so is very nice and smells great. Used to grate soap to make my laundry detergent. Switched to this and it works and smells great and saves me time! Love this soap. It has a nice scent and it's great to use in a DIY hand washes and shampoos. Been using this soap for about 20 years. Love it. Just bought this Peppermint and the unscented. I used the unscented for the kids bath and the peppermint for hand soap and my own laundry detergent. This stuff is amazing! I'm shocked that I already used half a bottle making my own stuff! Excellent soap for cleaning everything. Amazing product! I'm thankful to often find it for sale on well.ca. It has so many purposes and is a must have in our home. Great product and like that it'should more natural and less harsh than many cleaning products. I use for dish soap, hand soap and multi purpose cleaner. Very happy with. I also love the almond scent. Important to dilute. I make foaming hand soap, I use it in the shower, can be used for just about anything!! Have been using it about 4 years or more, love it! I love all the soaps in this line but particularly like the tingling feeling I get on my skin after using this soap. That said, my sister has sensitive skin and finds this one to burn her skin so if you have sensitive skin, maybe stick to the baby unscented version. I love this product. I use it as my kitchen hand soap especially because it is organic so no worries when handling food. The peppermint scent is perfect - smells "real", because it is! Multi-purpose soap, smells amazing works great ! Awesome product with so many uses - One of my must haves! I tried Dr. Bronner's after my brother recommended it to me. I've struggled with acne and it works very well to diminish my spots. It is the only product I have been using to wash my face. this has been my favourite hand and shower soap for almost 10 years. it took me a bit to realize that watering it down was a good option to not only help it last longer but also to thin it out so it didn't clog and hard up in the soap dispenser (which unfortunately once made it shoot out into my eye - peppermint is not so refreshing there! i've watered it down ever since). I bought this soap on recommendation from a neighbor after I was complaining about sensitive skin. I am in love with how this makes my skin feel - not dried out and not greasy/oily from additives. The peppermint is so nice and refreshing, and I love that there are lots of uses. Each day I learn about a different way I can use this very versatile soap! A little goes a very very very long way! This is my favorite liquid soap. I use it for everything, cleaning the house, wash my hands,body and hair, mix it with my diy toothpaste. I love it's smell . Great product. Foams up well, only need a little so the bottle lasts a long time. Just the right amount of "minty-ness"
Fabulous as a body wash. Makes your skin so soft and tingley! Love this! I reuse foaming soap containers and add about 1/3 soap to 2/3 distilled water. Works great and smells amazing! Great product, love the peppermint, use it for my homemade shampoos, no longer buy ready made shampoos with all the toxic ingredients. Used this product as a regular item at our tattoo shop, Noah's was having stocking issues so I turned to Well.ca as I knew you guys were reliable! Great soap, great product and company!